TZ: Your first novel, Crybaby Butch, was published by Firebrand Press, a relatively small feminist and lesbian publishing house. Ten years later, All I Love and Know, is getting the royal treatment from a major commercial publisher. Do you think there’s anything fundamentally different in these two books in terms of either commercial appeal and/or style that explains their different publishing homes? TZ: For good or for bad, the Internet never lets us escape our pasts – and one of the things I learned from a little Google searching was that your original title for an earlier version of this novel was Noah’s Ark. Was the title change your idea? The publisher’s? And how important do you think a title is to the reading of a book? JF: Changing the title was my editor’s idea, and it took us a long time to find it. I loved Noah’s Ark because it took up the Bible story and queered it: the journey from catastrophe to salvation, the couple (two-by-two) both being men. The kids had a Noah’s Ark set that the adults kept stepping on and that Matt had a lot of ironic commentary about. But my editor David Highfill felt it was wasn’t an inviting title, it was too Old Testamenty, and I had come to trust his instincts. TZ: As I read All I Love and Know, I kept thinking that this was a story that only you could tell and that it also must have been painful for you to write, given the many ways the lives of the characters seemed to touch and morph on fundamental aspects of your own. But then I also remembered you once quoting one of your MFA teachers about all good fiction coming from this kind of personal pain, and soul-baring (the exact phrasing was more graphic). Were any parts of this novel particularly painful for you to write? JF: The most painful part was, when creating Daniel, having to dig deep and imagine what it would be like if my twin sister Paula died in a terrorist attack. Imagining that horror and loss took a lot out of me. TZ: One of the novel’s less trumpeted – but, to me, particularly resonant – motifs involves reconciling the desire to be accepted with a pride in being distinct and “other.” You touch on this not only with respect to the gay experience (up to the wedding/non-wedding at the end) but also with respect to Daniel’s choice to differentiate himself by alloting traditional honors and dreams to his twin brother, Gal’s need to fit in but also receive special recognition, locales where characters hope both to belong but also diverge from the mainstream (Jewish summer camp, Northampton, Jerusalem), and perhaps even the Israeli self-image, particularly in relation to Palestine. Was this a motif that you intended to build into the novel? JF: That’s a great question. I don’t know if I consciously intended to build it in, but it is true that, like many gay people, I struggle with that tension a lot. That marriage became the biggest arena for gay rights in the 20th-21st centuries is regarded with skepticism by many who believe that our goal shouldn’t be to be like everybody else, but rather to subvert the dominant order. Matt is a voice of that skepticism in the novel: when he reads the book Gay Dads, where the dads say things like “We’re just a boring normal family,” he wants to stick a knife in his eye. TZ: Your abilities as a creative writing teacher and critic are widely praised, and I speak from personal experience when I say quite deservedly so. 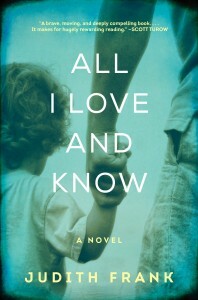 Of all the advice and guidelines you’ve given over the years, which did you find most difficult to follow yourself in writing All I Love and Know? JF: Aw, Terra, you’re the best. Believe it or not, I almost always follow the advice I give my students – probably because most of it comes from my own experience. I’m not a big fan of free-writing, which I have them do all the time because theoretically I believe in its capacity to push past the censor in all of us. But I do keep a journal where I do a kind of meta-writing to work out problems (“Wow, I’m sure having trouble with this scene! It’s so inert! What’s its problem? Do I need it?”). Judith Frank is a professor of English at Amherst College. She holds a BA from the Hebrew University in Jerusalem and an MFA in creative writing and PhD in English from Cornell University. She received a fellowship from the National Endowment for the Arts for All I Love and Know (William Morrow, 2014) and has had residencies at Yaddo and the MacDowell Colony. 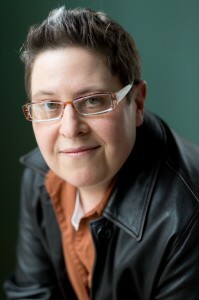 Her previous novel, Crybaby Butch won a Lambda Literary Award in 2005.